Large Installation Drawings in Chalk, Ash, Pastels and Powders by Robert Burridge. 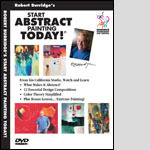 The newest and biggest "Robert Burridge's Workbook & Studio Notes" features more creative ideas for loosening up your paintings and your artistic life. 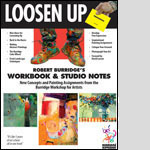 Create Show Stopper Paintings with these 11 Loosen Up Workshop Notes. 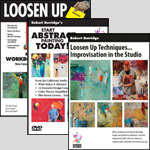 These are the exact painting workshop handout notes from Robert Burridge's "Loosen Up Workshps for Artists" series. 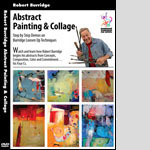 Learn the "secrets" from professional painter and teacher, Robert Burridge and his marketing director, Kate Burridge, in an information-packed workbook filled with handouts and lecture notes from their successful course of Art Marketing. Back to the “Burridge Basics” with his classic Loosen Up series of single subject exercises, floral still lifes and elusive landscapes. Back to the “Burridge Basics” with his classic Loosen Up series of single subject exercises, floral still lifes and elusive landscapes! Very hip film for the painter who wants to really start abstract painting today. Learn the 12 design compositions, "extreme painting" section, Bonus BobLand and more. Burridge shows you his personal techniques to really successful acrylic compostions. He is constantly moving, painting - talking and you can't help but have fun watching and learning from all the great things that he has to say! Watching Bob paint is alot of fun - learning from him is even better! 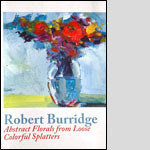 The focus of this DVD is preparing several small pieces of gessoed watercolor paper and then splashing and splattering loose and juicy acrylic color on them.The end result is a series of abstract floral paintings, created from basic design and composition techniques that are familiar to every artist. 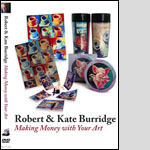 In “Making Money with your Art” Robert and Kate Burridge candidly answer the top ten burning questions that artists have about selling their artwork. 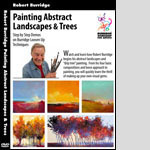 Watch and learn how Bob begins his abstract landscapes and “drip tree” paintings using acrylics, tissue paper and his twenty years of teaching experiences. Please note that we now offer payments via PayPal and PayPal Bill Me Later. You will find the Bill Me Later option after you choose the PayPal payment option in the shopping cart system. Please click on the PayPal Bill Me Later logo below for detailed information. 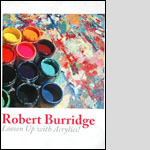 Any questions please contact us at 805-459-1503 or rburridge@robertburridge.com.